A panoramic tour of Messina. Stop at the Cathedral square. You will see the 213 ft clock tower (or “Campanile”) with the largest astronomical clock in the world, built by a Strasbourg firm in 1933. Next to the Duomo is the marble Fountain of “Orion” by G. Angelo Montorsoli, a very elegant representation of Messina’s mythological founder. 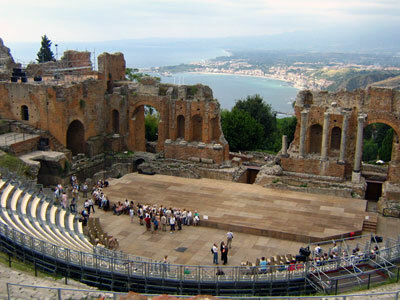 Continue along the scenic coastal road to Taormina, the most famous and charming resort town of Sicily. Visit the Greek-Roman theatre, then time at leisure for shopping in the main pedestrian street, Corso Umberto. Back to the port at the end of the tour.